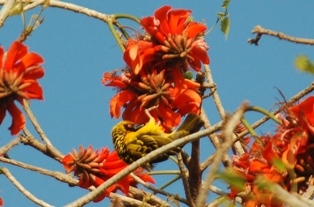 Many weavers are generalist nectar-feeders but are now considered to be the major pollinators of aloes (see Cape Weaver). 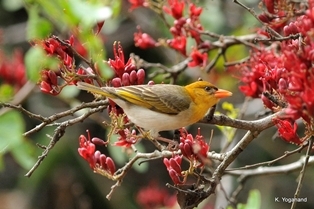 The fodies all feed on nectar, and the Rodrigues Fody even has a brush-tipped tongue that is adapted to nectarivory. Three species were reported as feeding on nectar for the first time as recently as 2014, namely the Red-billed Buffalo-Weaver, White-browed Sparrow-weaver, and Red-billed Quelea (see news about paper). Some publications list the Chestnut Weaver as feeding on nectar but this is an error, and the food plants listed do not even occur in the range of the Chestnut Weaver (see news about paper). 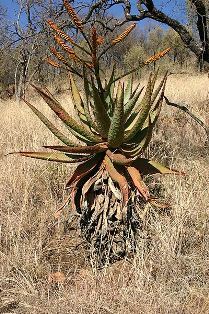 The nectar of Aloe marlothii attracts more bird species than any other plant thus far recorded, and this seems to be true in the case of the weavers too, with 14 weaver species being recorded (Oschadleus 2014). One Asian weaver, the Baya Weaver, is known to feed on nectar. The list below shows weavers that have been recorded as feeding on nectar, but many more weavers are likely to do so. The categories are based on number of literature references, as a proxy for frequency.